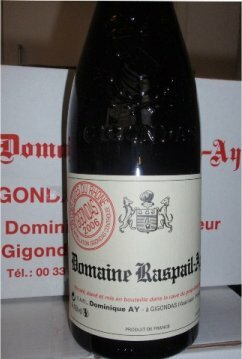 Founded in 1854 with 18 hectares under vine planted to Grenache (80%) Syrah (15%) and Mourvedre (5%) proprietor Dominique Ay keeps things very simple at Gigondas’ finest address – one red and one Rosé. 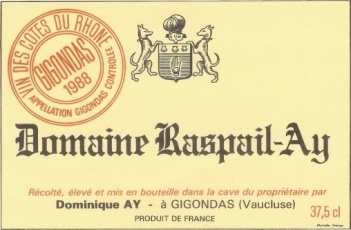 The Raspail-Ay Gigondas reflects the appellation’s characteristics faithfully in an elegantly robust style which needs four or so years for the tannins to meld with the wine. Dominique leaves as much as possible to nature in the vineyard and applies a minimalist approach in the winery. All grapes are de-stemmed prior to the spontaneous ferment which last for 15 days; the maturation for the Grenache takes place en foudrés, the Syrah and Mourvèdre in second and third use barriques with two rackings prior to bottling after eighteen months without fining or filtration. ‘One of the benchmark producers of Gigondas, especially for elegant, complex wines that represent a synthesis in style between a grand cru red Burgundy and a southern Rhone, …’ Robert Parker Jnr. This is gently spicy, clean and fresh with some plum fruit notes and hints of provencale spice. The palate is medium to full bodied yet fine with a delicate texture which is silky, powerful and long; it displays a lovely sweet spot; the flavors are suave advancing raspberry and cassis with buried tannins. Vintage in, vintage out this Domaine turns out one of the appellations finest wines. Neither the brawniest nor the faintest, just beautifully balanced and silky flavoured rich Gigondas. And it is from magnum with 10+years of age when the magic commences. The Burgundian-like aromas which are ethereal and evocative and replicate on the palate, the velvety texture with elegance but builds through to a more powerful and explosive finish. ‘Potentially the finest Gigondas made here since their sublime 1978 (still going strong, by the way), the 2007 exhibits gorgeously sweet black currant, kirsch, and mineral notes intermixed with hints of cigar box and forest floor. Full-bodied with elegance married to considerable substance and power, a beautifully textured mouthfeel, and a long, heady finish, this will be a long-lived Gigondas. Give it 2-3 years of cellaring and enjoy it over the following 15 years. 92 pts’ Robert Parker Jr.